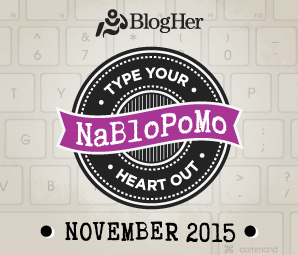 This goal, if you've followed along, was to participate in NaBloPoMo which to me meant I would be posting daily since that was the challenge. I've missed some days. Part of me wants to mistreat myself, talk down to myself and tell myself what a loser I am; the old part of me. The healthier part of me (who is winning a little more each day) encourages me. The one or two days I forgot shouldn't be a big deal. There were days I felt like I had nothing more to offer than what would fit in a facebook post or tweet. On those days, I chose not to make a separate blog post since I only have 2 followers on my blog and use my facebook to promote what I write anyhow. The bigger accomplishment though, was staying on track and even ahead of things for Thanksgiving and Christmas prep. That was a bigger goal and I've done the best at that this year than years before. I also (mostly) kept up with my normal to-do's of running a household. I've known my perspective on quitting and failing has needed an overhaul. It's one I've been slowly making, and that...that is a success. What is a definition of something you need to reframe in your mind, or that you have already? Labels: growth & change, NoBloPoMo. Success. Success is making progress, and not only being finished with something. If I make progress, that is just as much a success as finishing. Success is moving one step in the direction of your goal. You've done that. I missed two days during the 30 days... I couldn't get it in, and I could have put a picture up, but decided that my 30 days would be fresh writing. So I would rather have 28 days of that than missing my goal. You reached your goal and next year, you'll go in knowing you've got it in you!